I missed the news of the passing of an individual – Robert Landrum. When I was most recently in Point Pleasant, West Virginia, I was able to have some friendly conversations with Bob. I had traveled to that Mothman location in 2011. I was there for a taping of an interview for Weird or What With William Shatner. I arrived a day early, so I could take a low profile, and casually walk around town. It was good to be there a decade after my pre-movie visit and see how the Richard Gere vehicle, The Mothman Prophecies, had changed the town. A new statute, a new museum, and many more active shops – along with an annual festival – were now a part of present-day Point Pleasant. I was shocked. How did he know my name, I thought? And then I looked beyond his face and saw behind him. There on the wall, a large television monitor was playing the documentary In Search of Mothman, which is bundled with The Mothman Prophecies. At the exact moment I asked the shop owner, Robert Landrum, how he knew me…my image from that documentary flashed on the screen. We laughed about it, and talked of Mothman and more. Landrum was open and conversational. I learned he was more than the store’s founder. 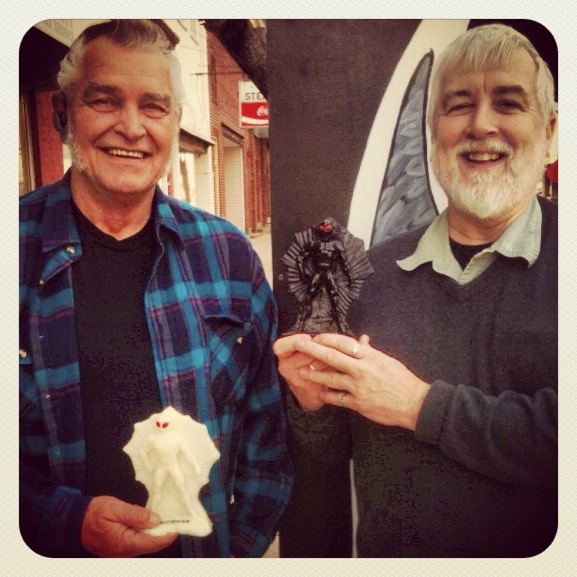 He also was an artist and had created some of the souvenirs, such as a plastic model of a standing, human-like Mothman. I posted the following photo recently in conjunction with Weird or What With William Shatner, which was originally broadcast on Discovery Channel in Canada in 2011. It has been broadcast anew on SyFy this week. Shortly after, I was told by Jeff D. that Bob had died. Robert E. Landrum, 69, of Shade [Ohio], died Saturday, June 2, 2012, at his home. Born Jan. 19, 1943, in Springfield [Ohio], he was the son of Mary M. Longfellow Doty of Granview and Orlando, Fla., and the late Merrill E. Landrum. He was a Shade resident for the past 35 years and owned and operated The Point Gifts and Souvenirs in Point Pleasant, W.Va. He formerly owned and operated Athena Hills Reality with his late wife, Kitty. He is survived by two children, Robert L. (Dee) Landrum of Shade and Anne K. (Keith) Ward of Shade; eight grandchildren, Kim, Jennifer, April, Cassandra, Angela, Brandy, Teya, Taniea; 13 great-grandchildren; three siblings, Carolyn (Sam) Clark of New Albany, Becky (Donny) Clark of Orlando, Fla., Bill (Sally) Landrum of Kentucky; several nieces and nephews; and his dog, Baby. Besides his father, he was preceded in death by his wife, Anne “Kitty” Landrum; and a grandson, Robert B.J. Lee. Services were held in June 2012 at the Hughes-Moquin Funeral Home with Father Mark Moore officiating, and burial was in Burson Cemetery. This is so sad to hear. I will be heading to Point Pleasant in June for my first visit. The photo and the statues are great. I know it would have been a pleasure chatting with Mr. Landrum.